Use the starter code and commit each step of the exercise, or more. Fork and clone this repo. Make sure you do your work in your fork. The command git remote -v should show a link to your fork, NOT to the original. If you cloned without forking, delete the clone now, and go back and fork it. Work in small steps and commit frequently. You must have at least the six commits below. When you're finished, push your code (if you hadn't already) and make a pull request, as usual. 7. Enable lifting of "brush"/"pen". Make it so that clicking the canvas "turns off" and "turns on" the paintbrush. Have there be an indicator that says "Paintbrush on" when it's on and "Paintbrush off" when it's off. Changing colors should not change whether the paintbrush is off or on. You've completed the assignment. Great job! If you have extra time and you wanna jazz it up more, keep reading! Add a color swatch/history. You should have at least 3 boxes (more are great) with the most recent 3 (or more) colors used. When you click on each of those boxes, it should set the current brush color back to that color. Create a Square class, and use OOP principles to create a data structure to keep track of all the squares. Each instance should have an property to store the squares colors, in addition to whatever properties you want to use to identify that square('s position) on the board. "Drawing" should update that data structure. All your existing logic/variables/methods (except the listeners) should become properties and methods of a game or app object. Other than the listeners, there should be no code in the global scope. The Square class should not directly refer to the game object—it should function totally independently. Next time you build an app, try to start out with a similar code structure. This entire process could be several commits! Let users save their drawings. Read about Local Storage. You can store pretty much any "object" there. Make a "save" button that saves your drawing to Local Storage. How many commits did you do for this one? Let users load previously saved drawings. Create a way to view a list of previous drawings from local storage, and load one up for further editing. git remote -v should now list four things, a (fetch) and a (push) for each URL (one on github.com, one on git.generalassemb.ly). Step 1: Find this section in the settings for your repo, and select master branch, and hit Save. Step 2: Wait a few minutes. 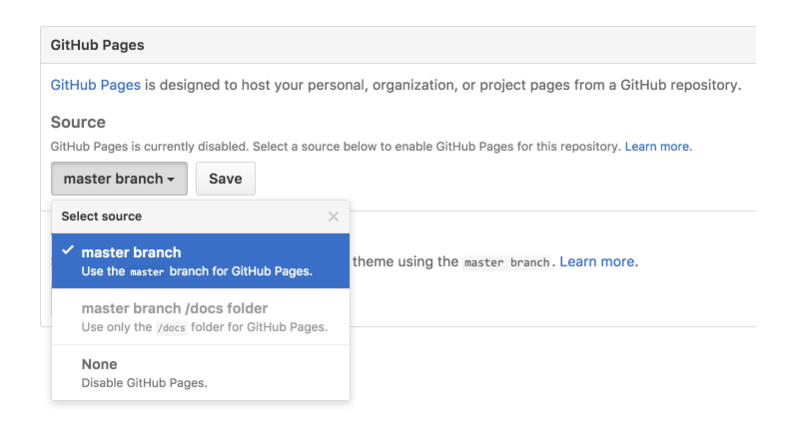 Step 3: Go to http://yourgithubusername.github.io/repo-name (substitute in your github username and repo name) and and behold your deployed app! See that it works!